Why not simply have fun in water? The ocean represents 70% of our planet and it never stop making humankind dream. Already, before birth, we grow in an aquatic environment, the amniotic sac. It is a very special link that we have have with water in general and this is why it fascinates us. Every year, more than 1 billion people travel to places all around the world, which make 1/7 of our population. Many among them choose seaside destinations which allows you to simply your fins and mask and run to the water so that you can explore all that lies beneath the waves. We never know what we might see and it makes the experience even more unique. 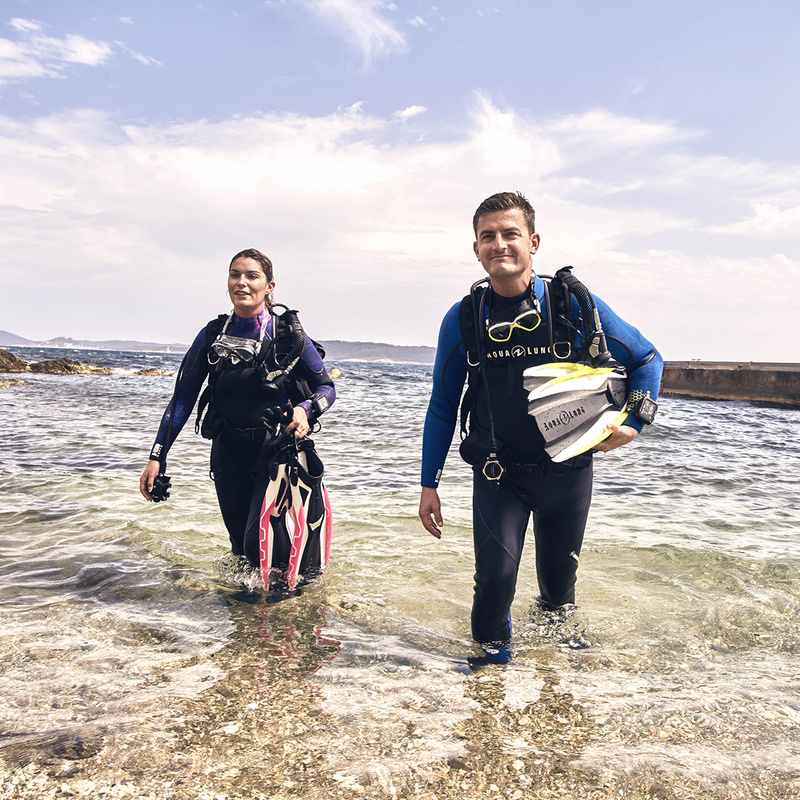 Many terms can seem pretty much the same when it comes to diving; snorkeling, skin diving, freediving… It gets hard sometimes to see which one is which, but here’s how to do just that. 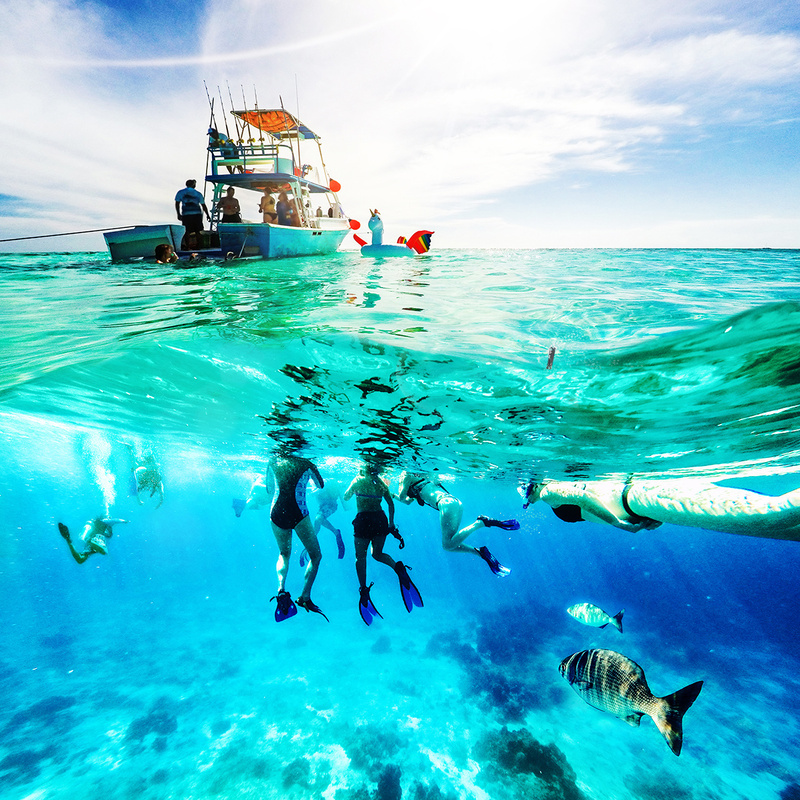 Snorkeling is when you stay at the surface to observe the ocean’s wildlife. For that, we often only use fins, a mask, a snorkel and a floating vest. When it comes to skin diving, it stays pretty much the same, only you are more eased in water without the floating vest and you even can go underwater to explore a bit on your own just to see what it looks like from another perspective the the one from the surface. Freediving, on the other hand, is really meant as a sport that involves to stop breathing and swim a distance or reach a depth. Basically, the difference between the three of them is how much you are diving underwater. Why should I take a skin diving course? Often, when people do snorkeling on a vacation, it is no that they don’t appreciate the beauty of the coral reefs and all the fishes it contains, but many are restrained by their lack of comfort in water. With the equipment , the waves and feeling stressed out in the water doesn’t help having the best experience possible. Everyone is not as eased in water, but once you work on it, it totally changes the experience that you are having. It comes in really handy to be able to respond in a calm way to losing your mask or simply to feel safe without a floating vest. When that kind of stuff becomes easy and that you can deal with it without breaking a sweat, it becomes natural to simply relax and focus only on enjoying your adventure. At some point, you might even surprise yourself by diving under the waves for a tour among some schools of fish. This is what the Padi Skin Diver offers; the formation that is required not to be bothered anymore by simple things which you can easily overcome and learn how to be more eased in water so that you can fully enjoy your next trip with more liberty of movement and with more pleasure. Skin diving is a version of snorkeling in which you are free of any floating vest and feel comfortable in the aquatic environment, you can even even dive beneath the waves to see everything from another perspective than the one from the surface. It is perfect for not letting bothered by technicals details on a trip and to have as much fun as possible on your next trip. This is what can make the difference between a fine excursion or an unforgettable one. All that is left to do is to relax and enjoy how beautiful the ocean is.